Posted by Client Care on Sunday, February 23rd, 2014 at 10:52pm. How to sell your belongings before you move? 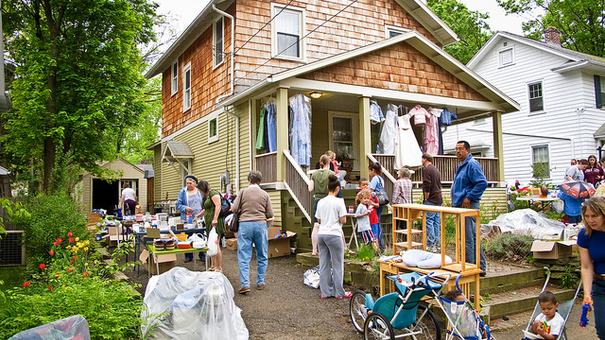 The best way to get rid of a large amount of stuff quickly is to hire a company to run an estate or moving sale for you. Otherwise, you can do what a large percentage of people do and host your own garage sale or post items on Craigslist. The benefit to hiring a professional company rather than doing it yourself, is that they will advertise your sale and try to find buyers prior to it. They also have regular connections to people and businesses who want to buy exactly the items you are selling. If you have items that are particularly valuable you may also want to consider an auction as well. Where to sell your stuff? The best part about contracting with an estate sale company is that your belongings never leave your home and the sale is usually over in a weekend. In return for the professional level of service, you pay out a percentage of the profit. Because you trust them to make a fair deal for you, you really want to research who to contract with. Make sure they are well known and reputable. If you need suggestions ask your local licensed Realtor and look on the Better Business Bureau’s website. When do you sell your stuff? If you are planning to do it on your own, you need start moving things out as soon as you can. This process can take longer than you think, especially if you are expecting premium prices. The benefit of pricing items to sell quickly is that you will not be stuck with as much stuff at the end, which you will either be forced to give away or move. Again the benefit of an estate/moving sale is your belongings are usually sold just before you move, making it a convenient and short-lived process.